Ever wonder what is like to turn heads while driving down the street? We found out quickly there are many old-time truck lovers! 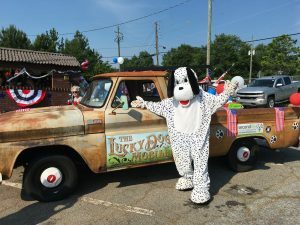 Wherever the Luckydog Mobile goes, there are honks and nods to the unique 1965 Chevy truck that was donated by one of our volunteers! Our Dalmatian, Lucky, is the inspiration for Second Life, and his legacy lives on! He has a truck and boutique named after him…not bad for a rescue dog who was days away from not making it out of the shelter. 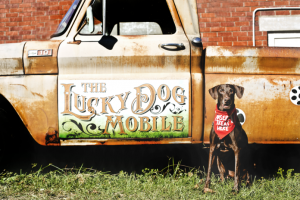 The Luckydog Mobile is used for pickups of large items within an 8 mile radius from our stores. It may not be a conventional moving truck, but it works for us and we are grateful to have it. Eventually, we hope to expand our radius for pick-ups and deliveries as our organization grows. If you see the truck out on the streets, give us a wave and hello!